Homecoming queen and king Andrea Garcia and Peyton Graves pose with the court. During halftime of the Homecoming game the Homecoming court was introduced, along with the announcement of the Homecoming King and Queen. 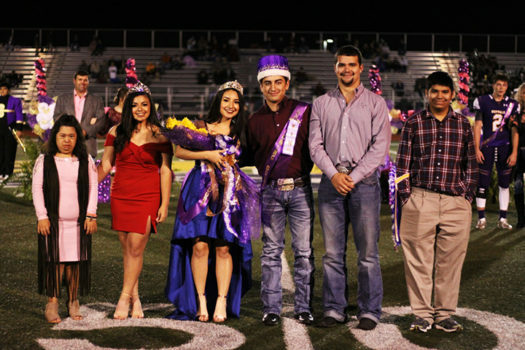 The bleachers were filled with smiling faces as the crowd cheered for Andrea Garcia and Peyton Graves, the 2018 Homecoming king and queen. Garcia and Graves were traditionally crowned by the previous king and queen. There is always some sentiment in being crowned by old friends and acquaintances, but the Garcia sisters took it to a whole other level. Nadia Garcia, the previous queen, was able to crown her younger sister, Andrea. The Homecoming queen nominees were Tana Cleveland, Andrea Garcia, Sheri Donaldson, and Makayla Gilliam. The Homecoming king nominees were Colton Green, Peyton Graves, Hector Dominguez and Jarrett Fishbeck. The Homecoming nominees were announced in October, along with the finalized dukes and duchesses. For some of the seniors, Homecoming was a night to remember, considering it would be their last Homecoming as BHS students.